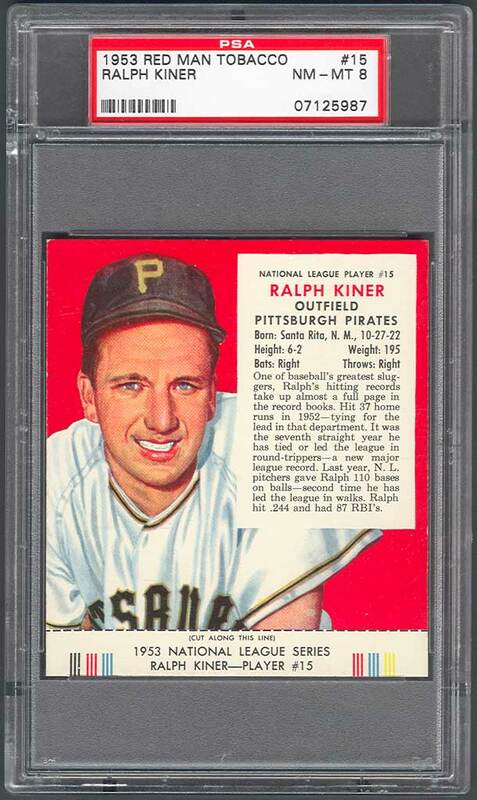 Joining Pittsburgh after World War II, in his first seven seasons Kiner led or tied for the NL lead in homers. He had 369 lifetime dingers (for an incredible 7.1 home run percentage), 1,015 RBI, and 1,011 bases on balls in 10 years. 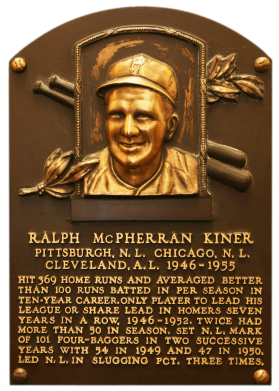 Kiner enjoyed a second career as a broadcaster for the Mets. 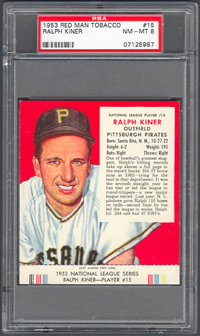 Comments: A 1953 Topps PSA 8 was the first portrait of Kiner I purchased. I don't recall the details behind it but it was one of the first 20 portraits I owned and purchased sometime between 1998 and 2000. 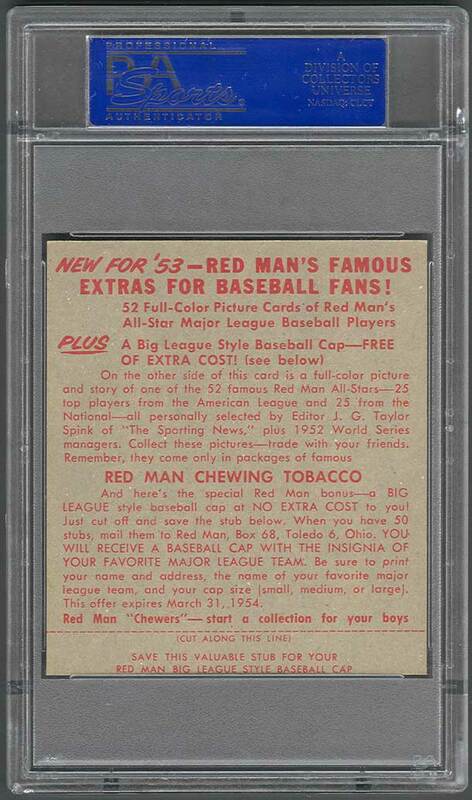 In early 2007 I purchased a 1953 Red Man Tobacco PSA 6 and subsequently upgraded to this PSA 8 in September 2007 after winning an eBay auction from seller Andy Tuttle with Rock Bottom Sports. 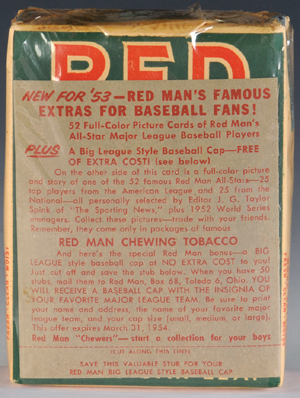 Description: This was the chewing tobacco company's second annual set of 3-1/2" X 4" cards, including the tabs at the bottom of the cards. 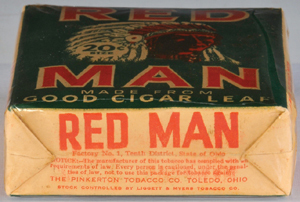 Formats for front and back are similar to the '52 edition. 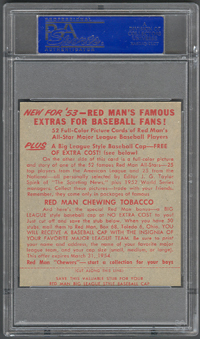 The 1953 Red Man cards, however, include card numbers within the player biographical section, and the card backs are headlined "New for '53." 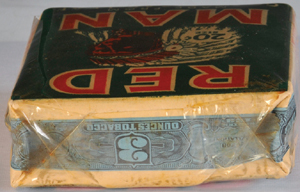 Once again, cards with intact tabs (which were redeemable for a free cap) are more valuable. Each league is represented by 25 players and a manager on the full-color cards, a total of 52. 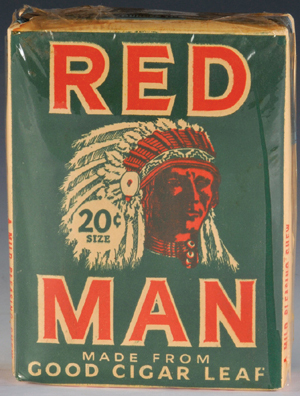 The 1953 Red Man cards can be found with either of two expiration dates on back, March 31 or May 31, 1954; neither commands a premium.